The Darkness That Comes Before was R. Scott Bakker’s debut, and I finished reading it a while ago, but I’m only just getting around to the review. In fact, I got waylaid needing to read a few other things for work, so I’m only now starting book 2, which kind of prompts this review. Wait, more preamble … I became aware of this book around the time it launched, which was in 2005, I think. And it always kind of slumbered at the bottom of my TBR pile. It was expensive and never discounted. Others complained it was too slow. Whatever. Lame excuses. 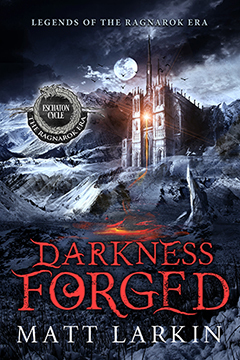 Because The Darkness That Comes Before is a grimdark exploration of philosophy, also pulling influences from diverse real-world segments of history. Which probably should have told me it would be right up my alley. And maybe The. Greatest. Thing. Ever. For the record, it’s not slow. It’s dense. It’s filled with some pretty complex musings on the nature of intelligence and how horrifying a truly inhuman intelligence might prove. Plot-wise, the book is basically the lead up to a crusade (Holy War) being made for partly religious and largely political reasons, and incorporates some of the insanely complex aspects of the real Crusades and the Byzantine Empire. With evil, crazy sorcerers. All of this is overlaid on the premise that 2000 years the No-God arose and created the Apocalypse. And was defeated, but might come ago and create a Second Apocalypse. Only a handful of people still care about this. This sets the stage for the arrival of Dunyain monk named Kellhus who is kind of superhuman in his intelligence and capacities. Kind of like taking Paul Atreides and making him even scarier. Kellhus’s people take elements of Buddhism and other self-denying philosophies, and remove any conception of compassion as meaningful. If our conception of reality and of ourselves is founded on a lie, everyone who doesn’t realize the truth is deceived. If someone is already deceived, the Dunyain believe, there is no harm in further deceiving them. And thus, Kellhus demonstrates complete amorality in manipulating anyone and everyone toward his end of finding his father. Combined with a lifetime of mental and physical training, and he’s … formidable. A large cast of other characters flesh out the points of views, including an overweight sorcerer who dreams of the last apocalypse every night, the prostitute who is kind of in love with said sorcerer, a violent nomad who wants to kill Kellhus’s father, and a corrupt, rather despicable emperor who’s machinations run quite deep. And I feel like I haven’t begun to do justice to the depth in this volume. So let me say this. If you like grimdark and you like philosophical musings, you need to read this book.